Around 2000, software synthesizers were starting to sound good, and computers were getting powerful enough to run them. While many sequencers could also record audio their emphasis was still on MIDI. What's more, they all involved a level of abstraction that many new users found very unmusical. Dealing with dots and lines on the screen felt very little like being in a real studio and more like computer programming. Reason was different from other programs on the market because, besides an audio interface and a MIDI keyboard, it required nothing else to make music. In it were synths, samplers, effects and mixers; all the elements of a real studio minus audio recording. Here comes the big synth! But since Reason was initially targeted at dance musicians, and dance music at the time was largely instrumental, the lack of audio was not a huge deal, and cut down the complexity of the setup significantly. You could just purchase the one program and be done, you had everything you needed to make music. The other thing revolutionary about Reason was it looked like real instruments. The mixer bore a striking resemblance to the Mackie 1604. The synth and sampler had realistic looking knobs, and they were all housed within a virtual "rack", making the metaphorical leap from real studio to virtual one that much easier. Even to musicians not familiar with traditional recording studios, the means of routing via "virtual cables" by turning the rack around just made sense. Finally making music on a computer was accessible to people who weren't computer people, and Reason was a huge success, spawning a series of imitators and changing the way people looked at designing music software. Reason 4 comes boxed with a DVD in a cardboard case and a slim Getting Started manual. Note that there is a 404 (due to chance?) pages manual in .pdf on the DVD. Your serial number comes on a credit-card sized piece of thin plastic. Registration is required in order to download updates. On the first launch, it ran you through a Setup Wizard which asked which audio interface to use and which keyboard you are using. Within 6-10 clicks, you'll be setup and ready to make music. Effects were Reason's weak points for a long time. Everything changed from v.2.5 with the addition of BV-512, a powerful vocoder, Scream 4, not an umpteenth movie sequel but a good and versatile sonic destruction module, RV-7000 a sophisticated reverb, better than the old RV-7. These three units have helped to raise the sonic quality, but there still were lacks in the EQ and dynamic fields. Then comes Reason v.3.0 and MClass Mastering Suite, an ensemble of high quality processors: MClass Equalizer (a 4-band parametric EQ), MClass Stereo Imager, MClass Compressor and MClass Maximizer. And the cherry on the cake was the Combinator, kind of Reason-in-Reason, allowing you to create complex synths or effects in a unique interface, with programmable meta controls and shortcuts. And for all old school synth freaks (and others too) Reason offers impressive modulationsand command resources. Just press Tab to have a look at the back of a full rack, and you'll see numerous I/O for Gate, CV, Mod, Audio commands. Almost anything can be connected to anything, ensuring incredible modulations, sophisticated sound or effect triggering. This side of Reason is often ignored, and it's a mistake because it's a very useful and very powerful way to create sounds, sequences, etc. With all these enhancements, Reason almost had all necessary tools to create professional-sounding projects. Especially as ReWire protocol allows to mix separate tracks in pro audio DAWs such as Pro Tools, Logic, Cubase, Sonar, etc., with top-notch plug-ins. However, and despite all these possibilities, there was still some lacks: firstly in the synthesis domain, then regarding the sequencer, which could have better MIDI editing capabilities, automation handling, etc. Guess what, Reason 4 answers to these expectations, and add even more: firstly, Thor, a "semi-modular" synthesizer fills the gap between the ordinariness of Subtractor and the edginess of Malström. Then you'll find a new Hardware Device, new modules, ReGroove and RGP-8, a revamped sequencer and a Tool window. At first sight, Thor offers a classic typology. But, when looking closer, you'll better understand why Propellerhead presents it as a "semi-modular" synth. If Thor has fixed modules (a Shaper, 2 LFOs, 4 Envelopes, an Amp, a Delay and Chorus), it also has three oscillators slots and three filters slots, all freely assignable. Thor is divided into Voice section, on the left in grey and Global section, on the right in brown. You can choose between 6 oscillator types, Analog (4 waveforms and PWM), Wavetable (32 wavetables each with up to 64 waveforms), Phase Modulation (inspired by Casio CZ series), FM Pair (simple FM tone generator, with a carrier and a modulator), Multi (produces detuned waveforms of the same type) and Noise (complete noise generator that can also be used as pitched osc or mod source). All the oscillators have Keyboard Tracking, Octave (nine!) and Tune (Coarse and Fine) parameters. Osc 2 and 3 can be synced to Osc 1, and a BW (bandwidht) setting allows to smooth the sync effect. Osc 2 amplitude can be used to modulate Osc 1. Then a Mixer will adjust output levels for Osc 1+2 (with a balance parameter) and Osc 3. I know virtual (and hardware) synths that don't offer so much possibilities. The sound is fat, with a lot of bottom end and there's no aliasing. Compared to Subtractor "analog" waveforms, Thor Analog oscillator sounds way less thin and harsh, it has a nice roundness when playing low notes and a fulness in medium and high that Subtractor can't reach. As Wavetable Osc has a nice blue backdrop and some PPG waveforms, I've compared it to the Waldorf PPG Wave 2.V. I can't say they are exactly similar, but they are without any doubt in the same family. FM Pair, when use in the three slots, allows you to reproduce any DX7 algorithms with three carriers/three modulators (faking more or less the feedback with AM from Osc2), but without all the envelopes settings, alas. That means that you can match the attack and global timbral of electric pianos for instance (the algorithms 5 and 6 were ideal for that), but not all the subtle (or not) evolution of their timbral characteristics. However FM Pair does a good job for all bell, plucked or metal kind of sounds. Here is a typical 1980's keyboard sound, between GS1 and DX, à la Russell Ferrante. Two Thor in a Combinator, the first with three FM Pair for the body and part of high end, and the second with two FM Pair to emulate the feedback that could have been done with DX7 algorithm 6 (Operators 5 & 6). Multi Osc delivers some nice detuned waveforms, but don't expect it to behave like TI/JP SuperSaw. I don't know if Multi Osc was meant for that, but it gives incredible results in emulating old string synths. Add a kind of vocal patch and you can easily mock up some Tony Banks parts. No sooner said than done, here are two Thor in a Combinator (in Reason 4...), for a kind of vocal/strings/organ/brass progressive sound. No effect added. Lastly, the Noise Osc offers White noise and Colored noise (with a knob to control frequencies), but it can also generate pitch, static noises and be used as a S&H LFO. Sound quality and versatility of these oscillators need good filters. So Propellerhead has made them... Thor has three filters slots, two that can be used in parallel or serial mode in the Voice section, the other in the Global section. There are four different filter types, including a Ladder LP Filter, a very nice sounding moogish filter, self-oscillating capable, with four slopes (6, 12, 18 and 24dB/oct.). Then, the State Variable Filter, emulating Oberheim SEM, is a multimode 12 dB/oct. filter (LP, BD, HP, Notch and Peak, these last two being sweepable between HP/LP, with self-oscillation). Then we have a Comb Filter you'll use to make flanger effects for instance. And finally, there's a Formant Filter, allowing to produce vowels by its X-Y parameters, and to change from "male" to "female" thanks to the Gender knob. You have certainly heard the "I Am Thor" preset, which is a very clever use of the formant, the step sequencer automating the vowel change (square wave to "æ", "i, duration of the spelling, some white noise for "Th" sound, etc.). Even if it's a bit difficult to program a phrase, you can use this filter to produce beautiful choir ensemble. But formant filter can also help making some really expressive leads. This a two Osc Thor (Analog and Phase Mod), with a Formant Filter (X/Y on two sliders of my K2500X) and a Low Pass Ladder in Global section, whose Freq is controlled by mod wheel. Reverb is RV-7000, delay is Thor. All the filters respond to Keyboard Tracking, Envelope (a dedicated one) and Velocity, which affects the Env. An Inv button inverts the Env action, and a Drive parameter sets the input gain. You can route independently each oscillator to one, the other or both filters. The first filter will then feed a waveshaper (9 modes and a Drive knob) that can be routed to either the second filter or directly sent to the Amp and its Amp Env (velocity sensitive, with Gain and Pan knobs). There's also a LFO here, and a loopable Mod Env. Then the signal finally goes into the Output section, with Global envelope (loopable), the third filter, the second LFO and Delay and Chorus effects. Wow... About the envelopes: they are way faster than Subtractor ones, with fast zipping effects, huge click effects and punchy character. Subtractor now sounds irremediably wimpy. It doesn't end... There's also a powerful modulation section, where everything can modulate anything, using MIDI controllers, Thor sections, audio inputs, CV inputs, etc. A destination can be modulated by a source using up to two "controllers", and a source can modulate up to two destinations. Need more? There's a step sequencer, allowing to program on up to 16 steps sequences for Note, Velocity, Gate Length, Step Duration and two assignable Curves, all at the same time and independently! It can run in step, one shot or repeat modes, in all directions including random, is syncable and can play on 2, 4 or full octaves. Thor definitely has everything to be a monster synth. So, how does it sound ? Definitely good. Forget Subtractor, you will never need it again (Thor can play in polyphonic mode as well as in mono, legato or retrigger). From big analog bass to lush pads, digital soundscapes to old school leads, formant sounds to FM FX, it can do everything. I know the examples I've made for this review are not quite "modern", but I'm sure you've already heard here and there lots of techno bass & leads, sequences and arpeggios. Hence these old-fashioned programs, which demonstrate that you can do almost any kind of sounds with Thor. Propellerhead has hired famous musicians and sound designers, and there's a bunch of Signature Patches, as well as "anonymous" patches that will ensure you hours of fun. However Thor is almighty when it's programming time, so tweak and tweak it again, you won't be disapointed. I would like to have mod wheel implementation to dial knobs and faders. That's my first criticism. The second is that, as Thor can do a lot of sounds, I'm not sure if it has its "own" sound. It's rather a "make-everything-with-me" synth than a specialised one, with its own personality. But it sounds so good that, hey, what the heck! Often new users are properly cautioned against quantizing to avoid sucking the life out of their music. On the other hand hardware sequencers like the MPC series are known for their quantization giving the tracks a certain groove. A lot of sequencers have a Swing function even if the term "swing" is hardly appropriate. The ReGroove takes this to the next level allowing you to apply quantization, shuffle, and groove templates to different tracks or groups of tracks. What may not seem like a big deal is actually a big step forward in terms of flexibility and power. Even the best musicians can use the ReGroove Mixer to make their parts fit the groove of other loops or parts while still maintaining some of their own flavor by quantizing to a certain percentage (in fairness, Logic's quantization is quite extensible and flexible, but not this easy to use). Producers with little keyboard skills can get their parts correct without everything sounding like it was done by Robbie the Robot. Especially for hip-hop producers this kind of quantization will make the transition from hardware to software even easier. For a long time, if you needed an arpeggiator, you had to deal with Matrix, which is quite not the easiest way to produce real time arpeggios, because it can't... No way to simply play a chord on your command keyboard and to have it up & down on 4 octaves in perfect sync with Reason tempo (or host tempo if you use ReWire). Thanks to Propellerhead, here comes the RPG-8, a powerful mono arpeggiator. The MIDI chords are recognized and transmit by a MIDI to CV converter, with velocity fixed or manual, octave transposition and Hold function. Then you can choose between 5 modes, up to 4 octaves and with a clever Insert function. When activating it, you can choose to have fixed notes selected from what you play (4 modes, really creative if you choose the manual mode in chord detection). Of course, there's a Sync mode with various time divisions, and there's a pattern editor, which allows you to make very sophisticated arpeggios. A zero-defect module. As Reason has evolved from dance production tool to general music production, it needed to grow beyond its somewhat limited MIDI editing capabilities, and the Sequencer has underwent a major overhaul but maintaining an easy-to-use, slick looking flavor. It packs a lot of features without getting too complex or taking you out of the music making process. Its implementation of automation tracks is very slick: for example, you open a window (More parameters), tick all the parameters you need, and when you press OK, Reason automatically add automation lanes for these parameters in the selected track. Or the edition/programmation begins kind of clip/object-oriented: you draw clips in the tracks, and you switch to edition mode, it's that simple. The dedicated REX editing mode made the already great Dr. REX even easier to push the limits of loop manipulation. An extra nice feature was the ability to "detach" the sequencer to its own window. With a two monitor configuration this allows you to work with sequencer and rack on different screens, keeping everything in front of you without a lot of clicking around. As I used it I found myself having to reference the manual a few times but rarely. This is due to both good UI design and an excellent manual. The two quickest ways to destabilize a system is to throw in a bunch of free VST plug-ins or try to record in real-time with sequenced tracks. With real-time recording you have to get into delay compensation and routing and monitoring schemes. All more things that are likely to make the software much more complicated and much more likely to crash. The beauty in Reason is it completely self-contained and solid, less susceptible to the kind of computer shenanigans that the rest of us are susceptible to, and the kind of thing that scares people away from making music on computers. Thanks to ReWire, you can manage audio in a dedicated DAW while having all the Reason sounds, the best of both worlds without sacrificing anything. And with Thor along with the other already included instruments, there is less and less reason to ever need any sort of outside plug-in, Thor pretty much covers the rest of the synthesis spectrum. So keeping it simple means keeping it stable and there is a lot to be said for that. Propellerhead chose their two largest points of weakness: their underwhelming choices in synthesis, and a sophisticated sequencer and addressed them completely. Thor is a soft synth dream and the new sequencer could teach many programs how to be both flexible and simple. I often recommend Reason to people just getting into computer-based music making. Because they will get the fun of making music right away and it will take them a long way before they run out of rope, if they ever do. For both beginners and pros Reason can often be the shortest route between you and the music in your head. While other products run off following the feature train, Reason remains steadfast in keep ease-of-use and stability paramount, with Reason 4 also undergoing some smooth, natural evolution. Overall it's a great product and Reason 4 is a confident and worthwhile upgrade to what has become almost a standard for creating backing and instrumental tracks. 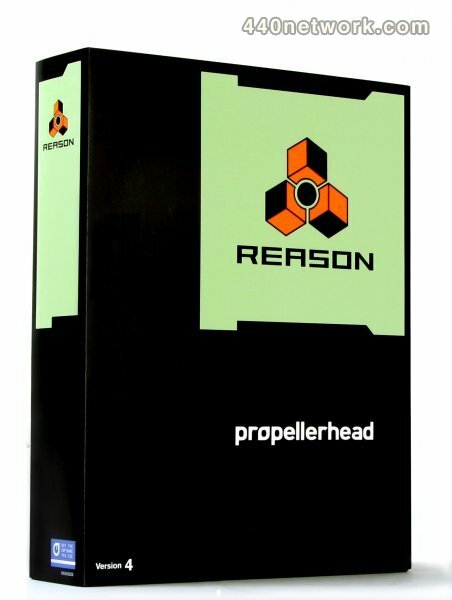 Reason 4 is a Propellerhead product.